We will be arranging pickets on the City Campus and at Emm Lane on each of the strike days between 08.00 and 10.00. 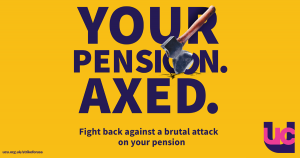 It is important that as many members as possible join us on the picket; a visible presence drives home the message that we will not stand for the attack on our pensions. Please follow this link to sign up for the picket.